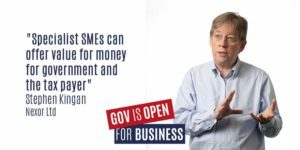 Nexor’s Chairman, Steve Kingan, has been selected to share his advice and experience on selling solutions to the public sector as part of the UK Government’s ‘Open for Business’ campaign. Last Autumn Steve was re-invited to be a representative on the UK Government advisory panel for Small and Medium Enterprises (SMEs). As a result of this, Steve will be taking part in a webinar to share his advice and experience on selling solutions to the public sector as part of the Government’s continued work with SMEs. This webinar has been set up by the Small Business Crown Representative, Emma Jones, who is working with the Government to provide support and resources for SMEs who are thinking about becoming a government supplier or who are already existing suppliers. Steve will outline in the webinar how Nexor became an official cyber security provider to the UK Government. Steve’s webinar on ‘Selling solutions to the public sector‘ will be on 26th April at 12:00 GMT. There are also other webinars over the next few months giving advice on how SMEs can sell to the public sector. Find out more about the Small Business Crown Representative and the resources available for small and medium sized businesses.